Since I have IR reflective sensors, the idea would be to connect them to an NCE AIU to detect position in 2 or 3 spots for speed control and automation. (Also I got an NCE Q-Snap to control 4 twin-coils, This would cover the front cross-over (2 turnouts), the yard entrance Y1 and the Y1/Y2 yard turnout. Really the point is learning and see what it’s good for since I can already control these turnouts with the Arduino/DigiX). One idea is for speed matching, using one NCE AIU and 2 sensors. Embed the sensors in the EZTrack pointing up rather than side mounted. Use these directly using JMRI/jython. This leaves 12 unused inputs on the AIU. How do I connect my IR sensors to the NCE AIU? 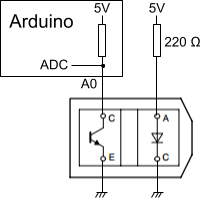 There's a good match here: connecting the IR receiver collector to the 5V/pull-up side of the AIU should do exactly what we want with the AIU input driven low when an IR reflection occurs. 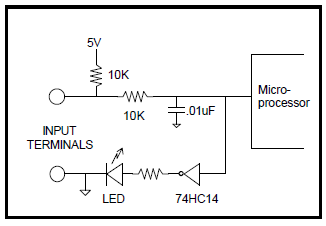 I can get 5 V to drive the LEDs out of the DigiX.